When cars collide, even at a low rate of speed, the forces at play can be astronomical. Imagine sideswiping another car, both going 35 miles per hour. Those forces aren’t so strong. But imagine those same two cars, traveling at the same rate of speed, directly towards one another. The force in that collision will be strong enough to do some major damage to the vehicles and even to the people inside them. What are some considerations surrounding head-on collisions? Read on for more information. Many types of injuries are common as a result of car crashes and collisions. But some are more common in head-on collisions. Head-on collisions also tend to have more serious injuries than other types of collisions. Nerve and soft tissue damage, as well as broken bones, are common. So also are traumatic brain injuries and other types of head and neck injuries that can injure the spine or spinal cord. It is important to have these injuries evaluated and treated immediately, not just for the success of your claim but for the protection of the lives and wellbeing of those who are injured. You may assume that all roads are created equal, and that a head-on crash is equally likely wherever you go. But you would be incorrect. Regional differences make head-on collisions more or less prevalent depending on where you are. Head-on crashes are more prevalent in rural areas, making up 13 percent of all rural fatal crashes. In urban areas, head-on crashes are responsible for less than 7 percent of all urban fatal crashes. The difference may be chalked up to a difference in road structure; rural roads are often winding, with many twists and turns, where it is easy for a car to drift into the oncoming lane. Be extra cautious when driving on rural back roads; reduce your speed and ensure that you stay in your lane. In some states, a “no-fault” rule is utilized. It means that a car insurer will pay all or some of the costs no matter who was at fault for the accident. However, South Carolina uses a “fault” rule. This means that the person responsible for the accident will be the person who pays for it, either through his or her insurance company or out of his or her own pocket. The inquiry doesn’t end there, though. You could be partially at fault, which would reduce the amount you would receive in a claim by your proportion of fault. For instance, if a jury found in your favor but also found that you were 10% at fault for the accident, your award would be reduced by 10%. An experienced attorney can assist you in understanding this principle. As you can see, there are several considerations one must contemplate with regards to head-on collisions. 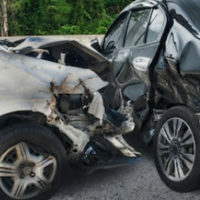 If you or a loved one has been involved in a head-on collision, you should speak to an experienced car accident attorney today to protect your rights and interests. Contact The Stanley Law Group in South Carolina. Call 803-799-4700 and set up a consultation today.